They say that an image is worth a thousand words. How about a video? 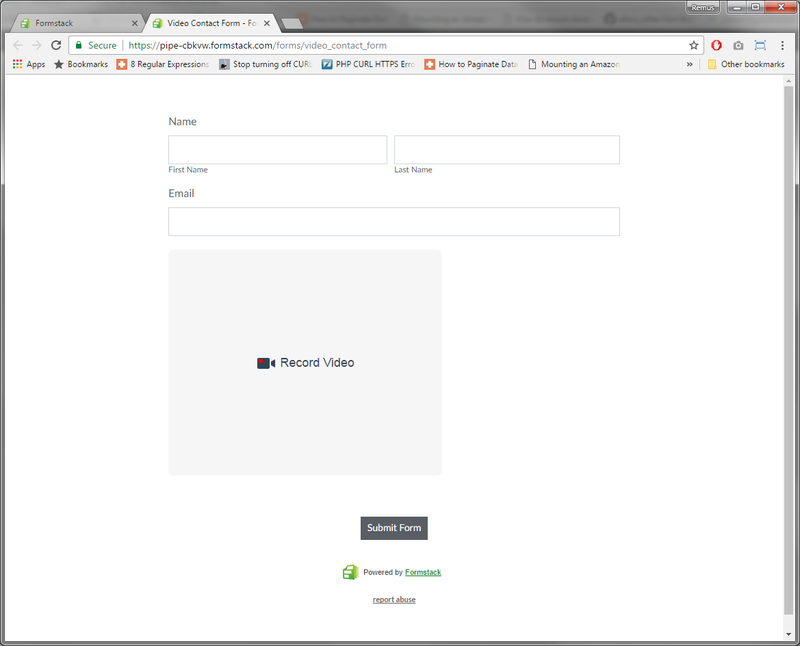 Capturing user generated videos with your forms has never been easier. 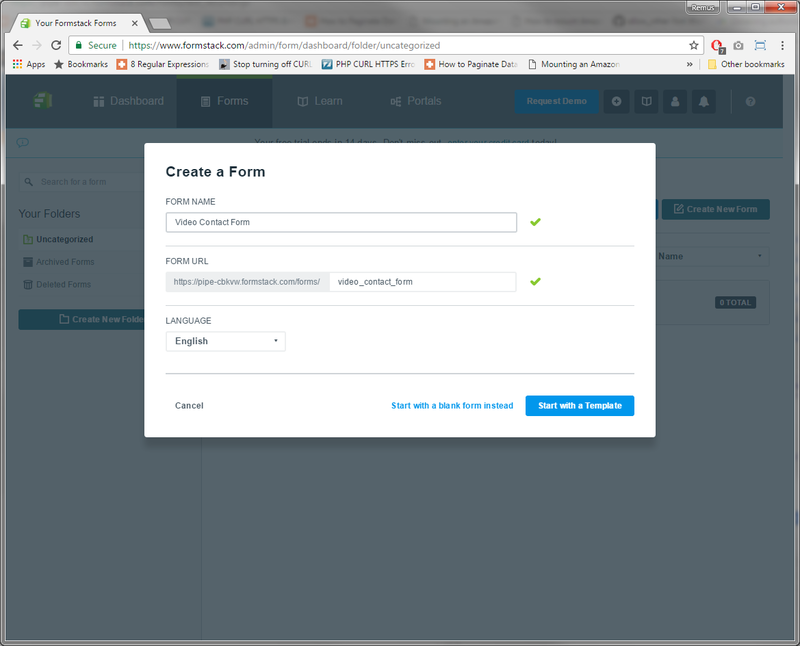 Whether you want to build a signup form, a contact form or a more complex questionnaire or qualitative survey that includes video responses, this tutorial will show you how to to do that using Formstack forms and Pipe. 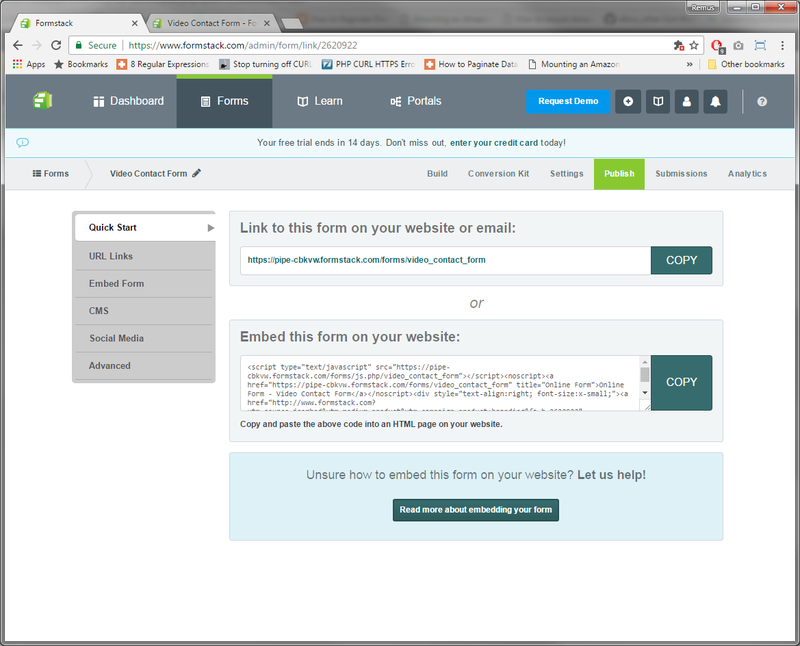 Formstack is a easy-to-use online form builder. No coding necessary, highly secure & flexible for all industries. Pipe Video Recorder is a simple to use video recording service with support for both mobile and desktop browsers. 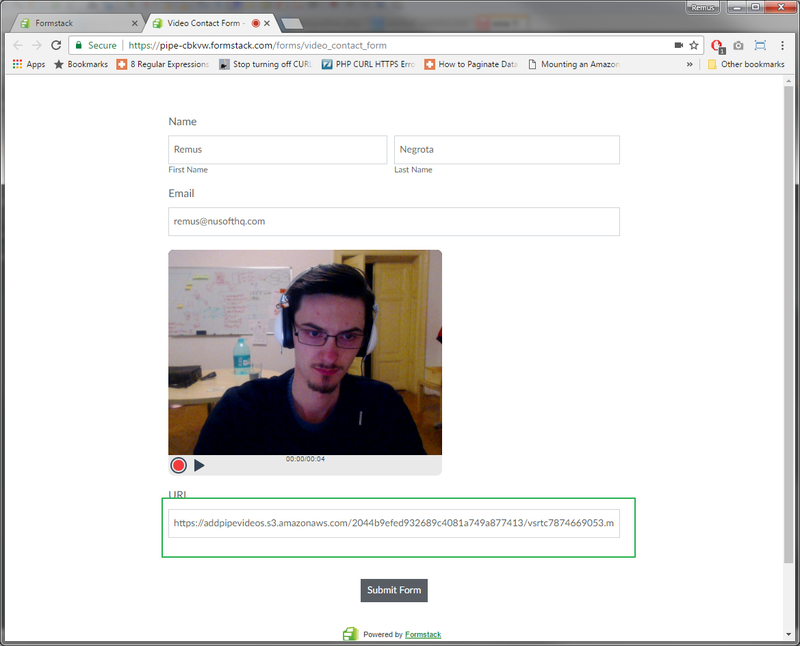 In this tutorial we’ll create a simple contact form with video recording powered by Pipe. We won’t be using any templates so click [Start with a blank form instead]. 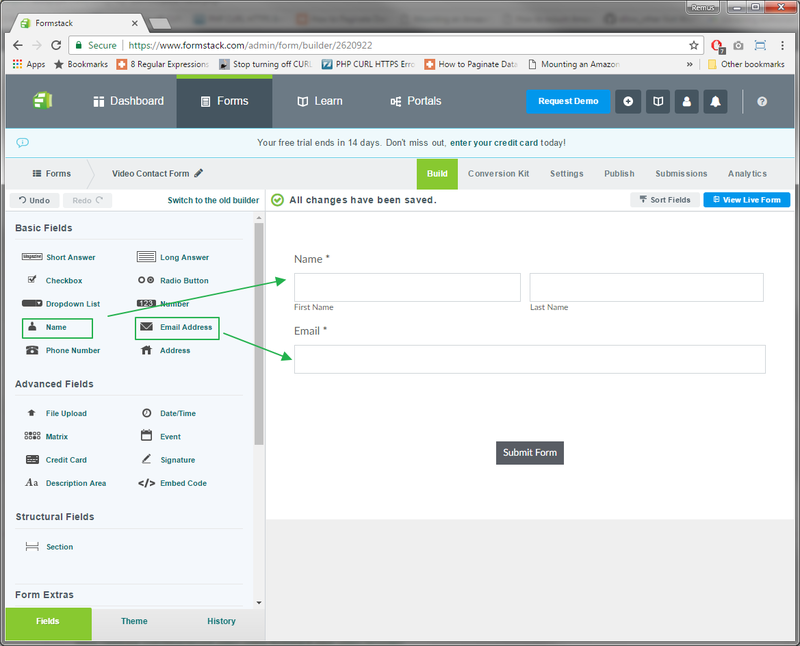 Email: add an Email field, also using drag and drop. Now it’s time to add the video recorder to the form. To do this we are going to use an Embed Code field from the Advanced Fields group in which we are gonna paste, you guessed it, our Pipe embed code. 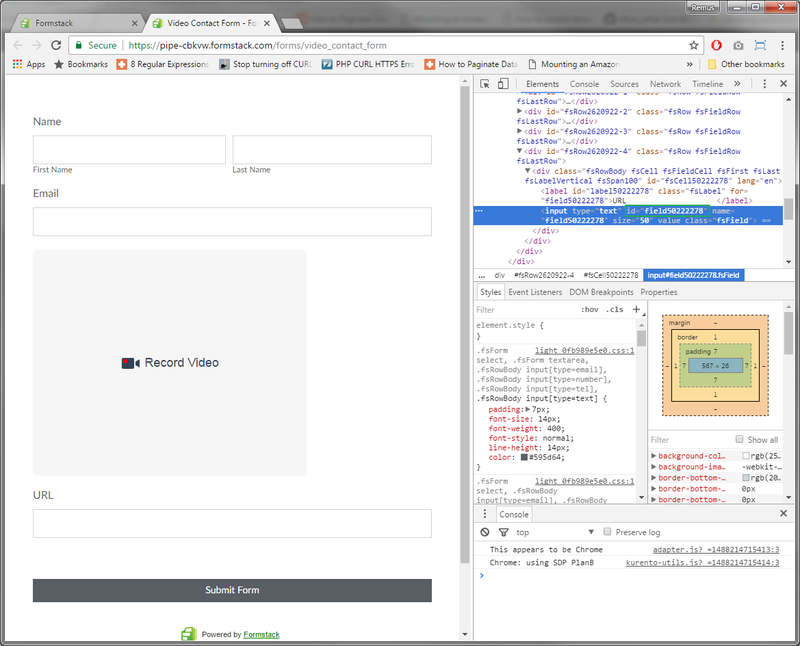 Add a new Embed Code field to your form using drag and drop. 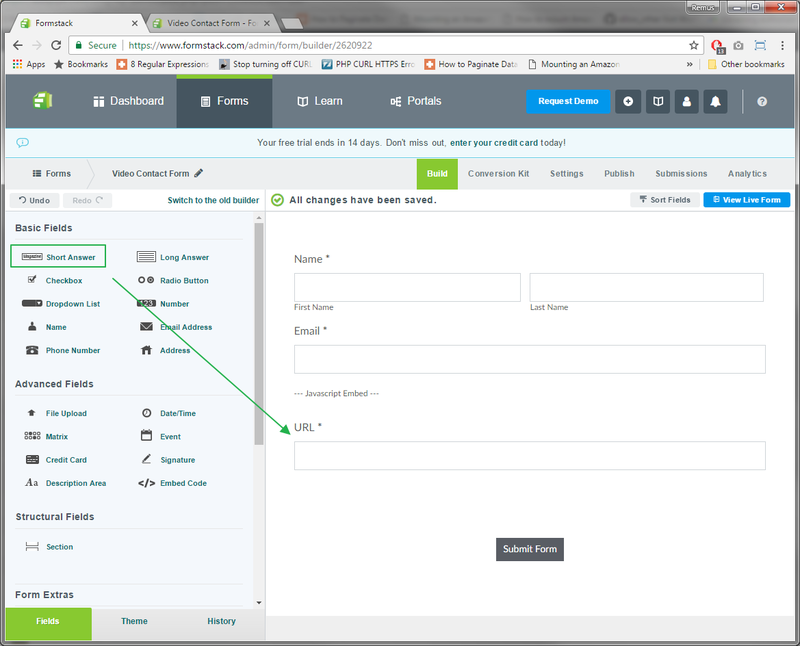 To preview you it click the blue [View Live Form] button at the top right of the form editor page. Anyone who will use this form will be able to type their name, email and record a video. But we will need somehow to link the form submission with the video that will be recorded. For this we’ll use a 4th input. Add a new Short Answer field from the Basic Fields group. We will keep the field visible for now in order to directly see the video URL. I named my field URL. This field will store the video URL and you can use it later. 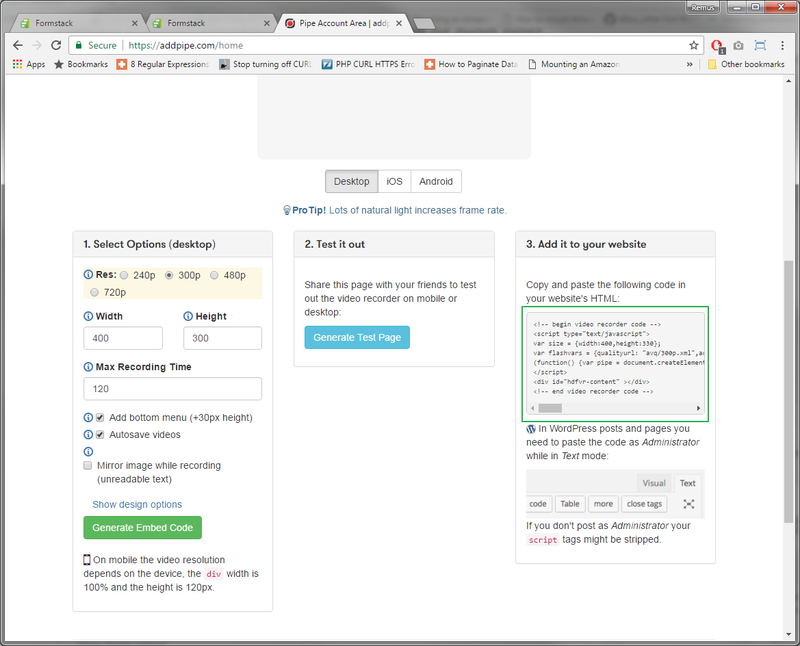 When publishing the form to your website you can and should transform the URL field to be hidden. 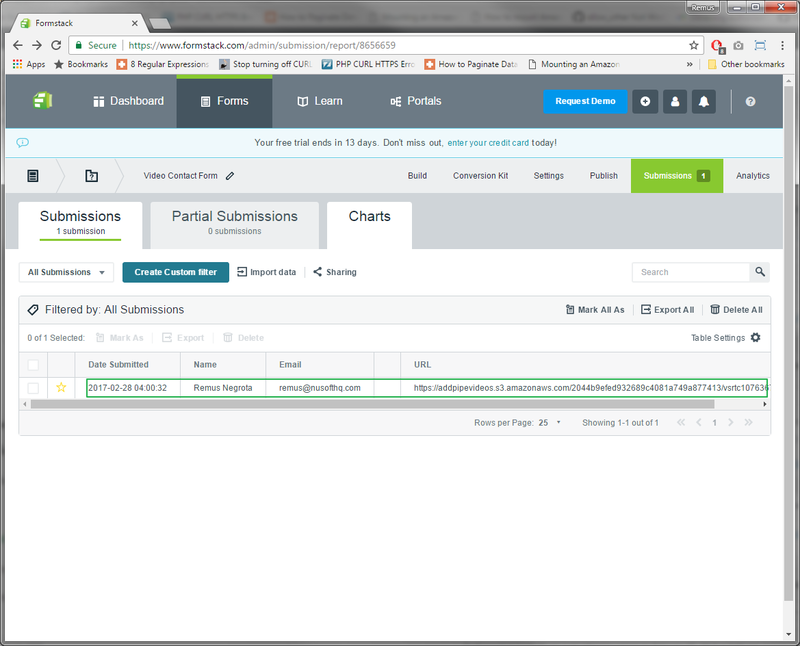 This can be done by selecting the field in the form editor and then click the Hidden checkbox on the left-side menu. 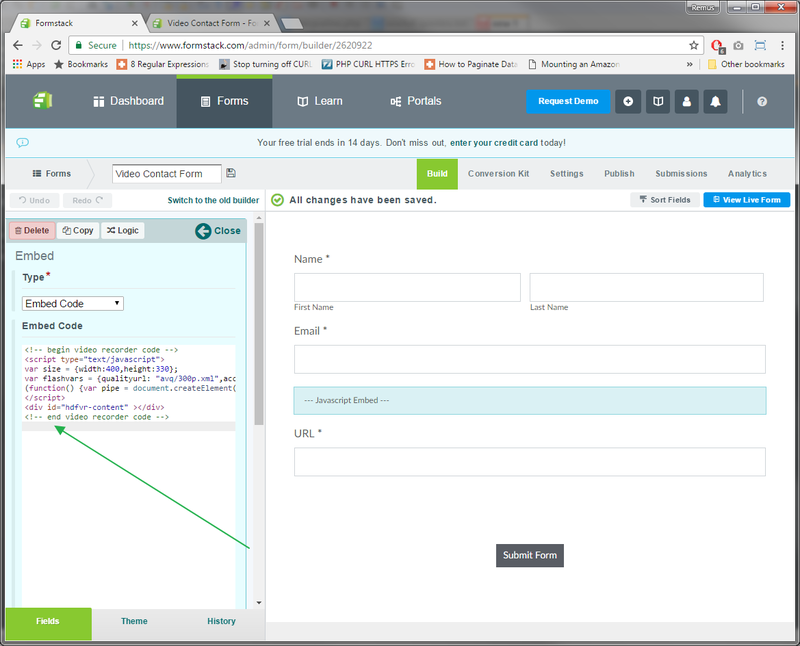 This way the URL value is still saved but the field won’t be directly visible to the user when completing the form. The video recorder will need to automatically fill the URL field with the correct video URL of the newly recorded video. For that we’ll be using Pipe’s onSaveOk function (part of Pipe’s Java Script Desktop Events API) which gives us the name of the recorded video and it’s storage location. We’ll use the info to generate the full URL. We will just be using the video name and location in our tutorial, but you can use any other video information sent by the function for your form submission. To make it work on mobile devices we’ll also be using Pipe’s onVideoUploadSuccess function (part of Pipe’s Java Script Mobile Events API). 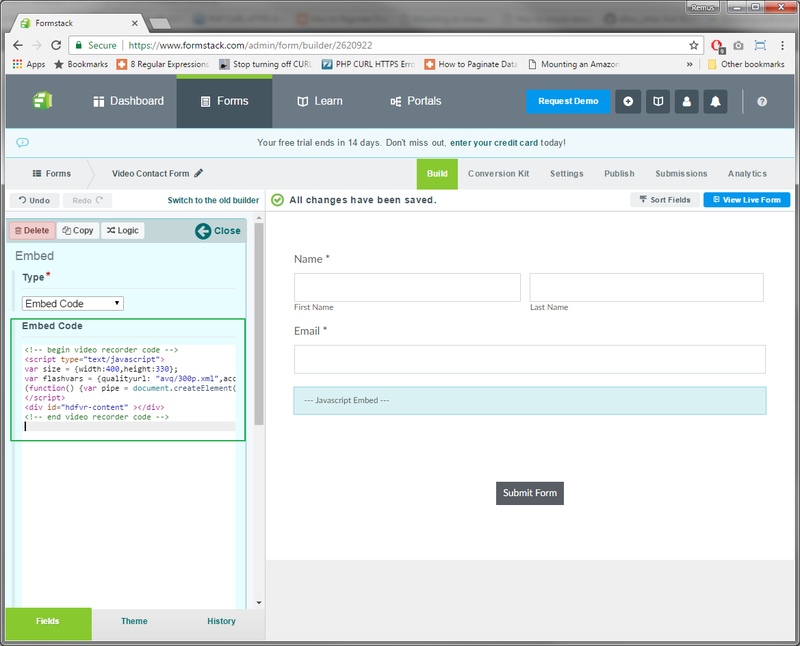 Click on the URL text field in the form page and the inspector will show the code for that particular field. We will only need the ID of the field: In this case the ID of the field is field50222278. Replace formstack_field_ID in the code above with this ID. If you preview the form and record a video, after you’re done recording (click STOP), the URL field will automatically be set to the newly recorded video URL. Here you can see all the data that was submitted with your form, including the URL (in this case the URL column) of the video that was recorded with Pipe. You’re now recording high quality video from your website visitors through a simple form created with Formstack and Pipe Video Recorder. 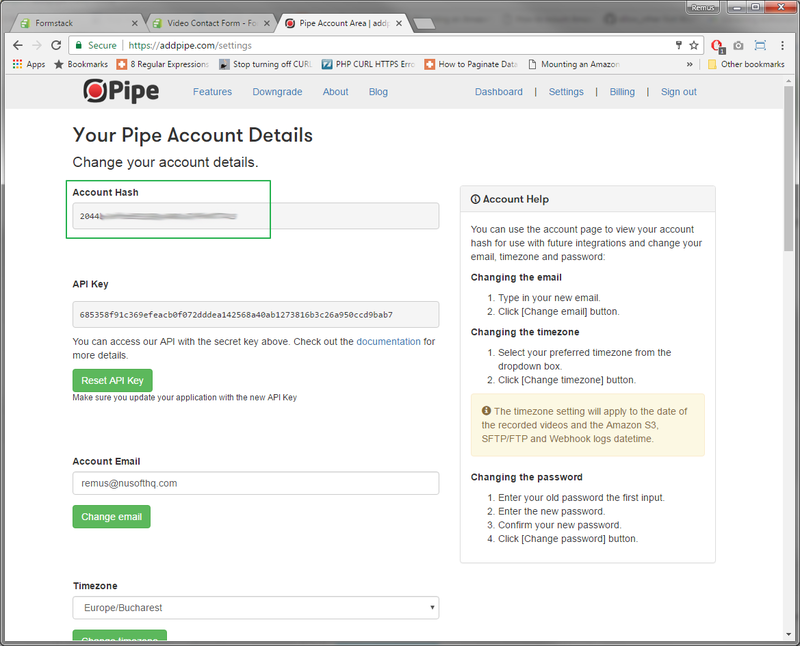 Not using Pipe yet? Get started today to capture relevant, emotion rich video content from your website visitors.